IlyaM (9k): Yesterday I played a game in a tournament against 5k. Several first moves are shown on the diagram (I played as white). I have a question about . I thought that it was a slow move and tried to punish it by stealing the corner territory (I've messed with this later but it is another story). After a game I with my opponent had an argument about . I claimed that it was a slow move but my opponent said that it was a good double purpose move as it treatens to steal the base from white group on the left side and it protects the corner. Myself I though that even if my group on the left side loses the base I'll steal a lot of potential black's territory in the corner and I'll be able to easily run in the center with my group on the left side. Any comments on this position? 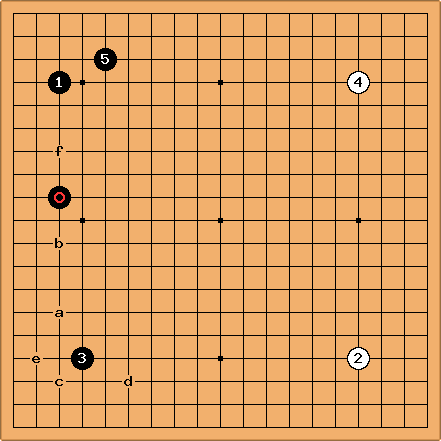 HolIgor: Go Seigen in his "Way to go in 21st century" makes moves like here and there. It is a good move as it gets territory in the corner and attacks the opponent. is important here. The drawback of the move is that it loses sente. White had to defend once at a. 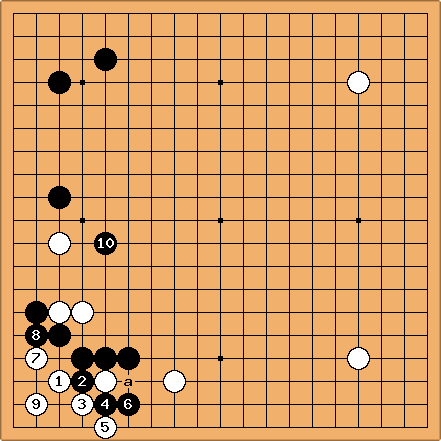 Black would connect and white could go on playing fuseki. As for the stealing territory in the corner, the timing is wrong. Black is alive in the corner. That is the main point. If black is alive then everything else here is yose. is OK. After , white a and then b becomes a good point, for example. dnerra: is pretty big. It might be a little slow (I would consider any of the moves marked with c), but really only very little, and your subsequent play turns it into a very good move. You have two weak groups in that area ( and the three stones on the left), and if you invade the corner, you Black gets additional strength to attack them. They won't die, but Black will have a lot of choice in how to benefit from the attack, probably best by building a moyo on the top. You don't say how you continued, but if you really want to live in the corner, I would imagine s.th. like this. ( at a would be better, at would be worse.) Look at this diagram for a while. If you don't think that Black got a huge advantage here, then you should try to understand why he has an advantage, and look at it again in a couple of weeks. And again, until you immediately feel Black's advantage by just glancing at it. Here is how I would play as White. If you have two weak groups, defend one of them! Which one? The one that is weaker and heavier. In that case, it is the group on the left. 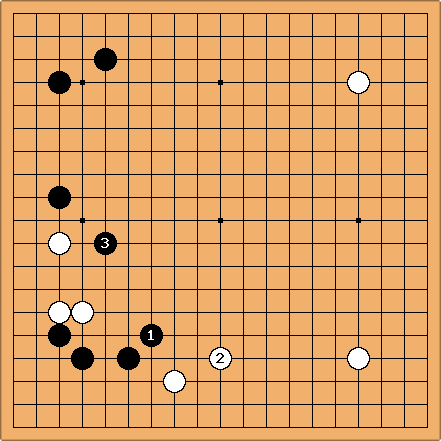 Now if White plays like that, the marked black stone becomes slow: Instead of attacking the white group from above, where Black could build a moyo while attacking, he has secured the corner. That is much smaller, in particular since the corner is still open from the bottom side. Bill: Your opponent's point about the dual purpose of in the first diagram is a good one. However, because the corner is open on the right, sealing off part of it is not so big. In addition, if White continues as dnerra suggests, with the one space jump, he is not only strengthening White, but pushing him out where he wants to expand. This is a better attack for Black, playing on a large scale and cramping White's group. Note that this attack also protects the corner, at least temporarily, as White cannot afford to invade. And the corner may get blocked off on the left during the skirmish, anyway. And oh, yes. You said, "Myself I though that even if my group on the left side loses the base I'll steal a lot of potential black's territory in the corner and I'll be able to easily run in the center with my group on the left side." First, it's not a lot of potential territory, still being vulnerable on the right. What makes dubious makes dubious. The corner is not a big deal. More importantly, the idea of running with an eyeless group early in the game is simply asking to lose. Granted, there are times when you invade or erase a moyo and that happens, but that's faute de mieux. It's not a plan to make when you don't have to. Andy Pierce: Now white either played a or b and black responded with . 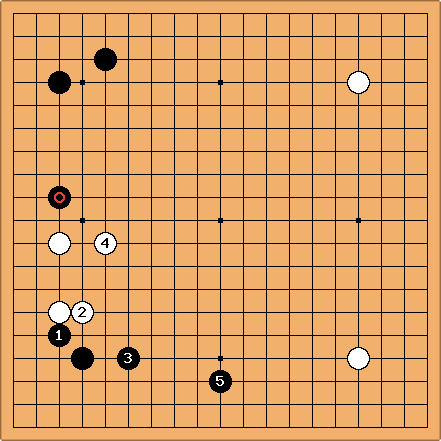 If white played a looking to pressure the corner, then in response to a pincer (even a super-distant pincer like ) you could just proceed with either the direct invasion at c or a double-kakari at d. Extending back towards the pincer at b looks strange to me. On the other hand, if white's initial intent was to wedge on the left side, then wedging at either or the space between and b would be usual. 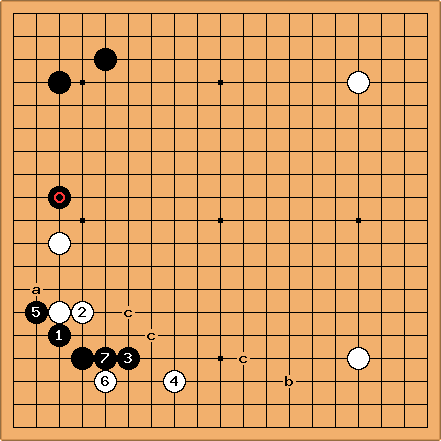 Wedging at b lets black make too good of an extension from his shimari at the top and can give white a cramped, less-flexible group on the left, as happened in the game. I don't know whether invading the corner at e followed by b to make life if black responded in the corner is a good idea or not. Black would then need at least one more move in the lower corner and that would let you eventually invade at f using your secure group on the left as support. IlyaM: I wedged with b and then played a after . Timm(5k): A quick side question : is in the original diagram (the kosumi-tsuke) the appropriate answer to white's approach ? I've been taught that I should be cautious with this move because it may end up reinforcing the opponent while leaving the 3-3 open. As far as I understand, it is important to deny White the slide in the corner. Would the iron pillar be an alternative ? Or does it offer White too much flexibility ? So is the kick the only move ? Slarty (2d): It's good to leave White with an extension that is cramped, even as the cautions you mentioned are partly true, and so the kick is the appropriate play here. As an alternative(s), the iron pillar and ogeima are miai. If Black plays the pillar, White will approach/pincer and be back to a decent development, getting to play on the lower side, which on this board was wide open. If Black plays ogeima, with iron pillar as followup, White plays the slide in sente, and ends in sente! However, there is still a fairly severe attack(s) against the unstrengthened two space jump, attaching at 7-4. So the kick is preferred as double sente that gives immediate gains, though if the center-left/lower side/elsewhere figures especially Black is not forced into the kick sequence where White makes a living shape sooner. Slarty: Good for Black; White invaded prematurely. is needed because the group is heavy, even though they might instead decide to try tenuki such as approaching on the lower side.